All the discussions about Employment Drug Testing tells you how important it is and shows you statistics as to why it is important. You may even know the Federal and State requirements to conduct drug testing, whether for only safety sensitive jobs or for all employees. Or maybe you are a new company that wants to be a Drug Free Workplace or a growing company that hasn’t put a program in place yet or only tests current employees and you aren’t sure about your next steps for your Drug Testing Program. As you budget and plan for the operating costs for employment and hiring, have you really considered the value of Pre-Employment Drug Testing in starting a Drug Testing Program or in further developing your current Employee Drug Testing Program? For most of us starting any new program, the hardest part is knowing where to start, where to get reliable information and guidance, and in this case, what Drug Testing Methods and Supplies are the most effective ones for your program. Even if you have a Drug Testing Program in place, you may be wondering if you have set it up properly or if it is as effective as it can be. Since the requirements for Drug Testing for Hiring/Pre-Employment and Employee Testing can vary, volumes of information can be directed toward you. What to look at? What to do first? Logic and calm can prevail if you simply think about the way you approach staffing overall – you hire and then you maintain your good staff. Why is Employee Drug Testing so important and how does it really benefit me? What are my most logical first steps to consider in setting up my Drug Testing Program or how do I need to expand my current Employee Drug Testing? What are the Legal Requirements related to Drug Test for Employment and where do I find that information? What type of Drug Testing Methods and Supplies should I use for my Drug Testing Program? So here are some of the answers, and DrugTestsInBulk.com is always here to assist you with answers to your additional questions. Alcohol and Drug Abuse contribute to safety and health issues, increase cost for insurance, disability, and assorted legal claims, they reduce the level of work productivity, and has been shown to impact overall employee morale. You may have seen repeated statistics on the impact of drug use on workplace costs and productivity. Without repeating them all, at least a few need repeating to remind you of the costs when Drug Abuse impacts your workplace. The Office of National Drug Control Policy (ONDCP) estimates that a minimum of $120 billion dollars is lost to productivity related to Drug Abuse, and an additional $11 billion is spent on related healthcare costs. According to 2014 records out of the Substance Abuse and Mental Health Services Administration (SAMHSA), Drug Abusers are 2.5 times more likely to be absent from work 8 or more days per year, are 3.6 times more likely to have an accident at work and are 5 times to file a Workers’ Compensation Claim. Additionally, there is at least one new factor to consider for reviewing your Employment Drug Testing Policy and one Major Human Consideration to keep in mind. New Factors – If you haven’t had a chance to read our Blog on the huge, deadly impact of Synthetic Designer Drugs (https://drugtestsinbulk.com/blog/why-should-i-drug-test-for-designer-synthetic-drugs-overdose-death-increases-are-fueled-by-synthetic-drugs/ ), you may want to take a minute to do so. Consider that the Center for Disease Control has said that the increase in deaths from just synthetic opioids such as fentanyl, grew 84.2 percent each year from 2013 to 2016, and they are still increasing. This is just one indicator that you may need to take a look at your testing program to make sure you are addressing some of the most major Drug Abuse problems of today in your dated testing program. The Additional Major Human Consideration That Companies Face: There can be serious legal implications that companies face because the National Safety Council has said that 80% of those injured in a “serious” drug-related accident at work are not the drug-abusing employee, but innocent co-workers and others. Putting the legal considerations aside, isn’t there the more human aspect that all of us who work day in a day out for several months and years with our co-workers, come to think of them generally as friends in our lives? Do we want to see them, or ourselves, harmed because of drug abuse related accidents – or worse yet, to see our friends die needlessly from taking a dangerous drug or from a drug overdose? So, what are my most logical first steps to consider in setting up my Drug Testing Program or how do I need to expand my current Employee Drug Testing? The very first and important factor for any employer to be aware of and adhere to is to follow every Federal and State mandated law or requirement for Drug Testing for certain specified jobs, especially in safety and security industries and positions or for Federal contractors or grantees. You have no choice in these situations if your company employs staff for these roles. Plus, beyond the legal mandates, you know you really don’t need a truck driver, fork lift operator, stock-handler, etc. Jeopardizing people’s safety or your valuable equipment and resources. We address where you can find assistance on the legal requirements in a following section. So, What Should I Consider in Setting Up My Employment Drug Testing Program? Your next steps in addressing how to set up or adjust your Employment Drug Testing program and policy may be based on whether you are a new employer who is just starting to hire employees, or you are an employer who just hasn’t really had the time to develop a strong Drug Testing program. If you are a new employer, the choice to place your first emphasis on Pre-Employment Testing is the logical choice. But, if you are company that has been in business for several years, you may want to ask yourself whether you currently have a reliable and strong employee base or whether you notice high turnover, high absenteeism, accidents, and other serious staff issues. If you notice any human resource concerns, you may strategically need to focus on Pre-Employment Drug Testing before perfecting or adjusting your normal Employee Drug Testing. Studies report that substance abusers are twice as likely than non-drug abusers to work for 3 or more different employers in a one-year period. Some employers conducting job fairs have reported that, when they have revealed that the next step in the employment application process would be a drug test, up to 50% of the applicants left the job fair or didn’t continue with the application process. Even if some had other reasons to leave, that is still a noticeable rate. A study conducted a few years ago for the Drug and Alcohol Testing Industry Association (DATIA) showed that 82% of employers indicated the drug tests they performed cost $50 or less on average, even as low as $10 or less. Cost for rapid turnover of an entry level employee has been estimated at $6,600. This amount does not include any costs for health care, Workers’ Compensation, extended sick leave, and lost productivity. Employers have not reported numbers of their positive testing results rate if they use instant product in-house, but major labs had indicated that 3.5% of lab tests conducted for pre-employment are found to be positive for drug usage. If just one of your hires is in that 3.5% and you are a small employer, would you rather have spent $50 or $6600 on the loss of that candidate? The impact on larger employers is obviously much greater. And, what if you replaced the high-turnover person with another possible drug abuser? Did you know that Drug Abusers tend to share information on the companies that do not conduct pre-employment or employee Drug Testing? Because of the above information and data collected on drug testing programs a year after implementation that reflected increase productivity, reduced absenteeism, reduced Workers’ Compensation claims, and especially reduced turnover rates, 57% of companies included in a study conducted for DATIA in 2011 indicated that they tested ALL job applicants. Approximately 72% of respondents with multi-national locations conduct pre-employment testing, and about half of the study respondents had 1 to 499 employees. We need to consider, in 2018, we are facing a much more serious Drug Abuse concern than in 2011, making Pre-Employment testing imperative and cost effective. What must I legally do to Drug Test for Employment and where do I find that information? The key point from the outset is to protect your company from any legal problems or liability, both against any government laws and regulations and against any liability relating to employee claims or complaints. Keep in mind that any information offered in this discussion only addresses Workplace and Pre-Employment Drug Testing Programs. Other Drug Testing programs related to criminal justice testing, treatment-related testing, or other miscellaneous programs is not covered here and will have different requirements and considerations. The Substance Abuse and Mental Health Services Administration (SAMHSA) website is a good place to review requirements (https://www.samhsa.gov/workplace/legal/federal-laws) This website is valuable resource for other links to specific agencies if you fall within the categories of Drug Testing Requirements that are Federally mandated. Just so you know, there is no requirement for most private employers to have a drug-free workplace policy of any kind but going without a program has generally proven unwise, as our statistics show. Also, if you want to ignore the general statistics, you should still be concerned about employee legal claims from harm encountered because of a Drug Abuse related event at the workplace. That said, required Drug Testing Programs apply to federal contractors and grantees, as well as safety- and security-sensitive industries and positions. Any organization or company that receives a Federal contract of $100,000 or more or a Federal grant of any size must have a published Drug-Free Workplace Policy Statement and must follow the requirements of the Drug-Free Workplace Act of 1988. Federal agencies have established specific drug-testing requirements for industries that perform public safety and national security roles, including those that hold contracts for the agency projects and programs. Employers and employees in such industries are subject to drug-testing requirements from the Department of Transportation (DOT), Department of Defense (DOD), and Nuclear Regulatory Commission (NRC), and Police and Enforcement Agencies. Beyond the Federal government Employment Drug Testing Requirements, States are generally in control of what must or can be done for Employment Drug Testing Programs within their jurisdictions, and each state has different requirements. However, most states encourage Drug Testing. They simply expect you to comply with their state-specific regulations. One of the most up-to-date tables of State Laws or Executive Orders, comparing requirements for Pre-Employment and Employee Testing requirements is available from the American Civil Liberties Union (ACLU) at https://www.aclu.org/other/state-state-workplace-drug-testing-laws . However, this summary does not cover some other considerations you might have in mind, such as options for discounts on Workers’ Compensation Programs. In addition, if a state is not covered on the table, it means it does not have specific legislation in place, but this does not mean that you should not be concerned about how you set up your program to protect your company from Workers Compensation or Unemployment claims. What this table does do is outline clearly what information must be provided in writing to candidates being tested and/or if a drug test can only be conducted after a conditional offer of employment. It is always legally in your best interest to have a signed acknowledgement and agreement by a job candidate or employee, reflecting they have agreed to being tested. As a result, if you find yourself with additional questions, it is always legally best to contact your State Department of Labor or other Employment-related or Insurance-related agency to ask for any clarity you need, especially since laws can change at any point. DrugTestsInBulk.com does have access to another supportive State by State Legal Status Guide and would attempt to assist you with some additional information. A search of the Internet for your particular State requirements also often provides up-to-date information that may direct you to several additional resources. Again, please remember these resources only addresses Workplace Drug Testing requirements, which are different than the Drug Testing requirements for other purposes such as treatment or criminal justice programs. YOU WILL NEED TO PUT A DRUG TESTING POLICY STATEMENT IN PLACE TO MEET THE REQUIREMENTS OF THE LAWS. Although it is generally preferable to have some sort of option for legal advice if you ever need it, many small businesses find themselves without ready resources to keep an attorney on retainer or on staff. However, this should not be used as a deterrent to implement an Employee Drug Testing Program. Employee Drug Testing Policy Statements can be relatively simplified but the provisions must be clear and always applied in a non-discriminatory manner to all employees not covered by some special legal provisions. Unless your State requirements are complex, it is suggested that you keep your policy statement as simplified as possible. A search of the Internet under “sample drug testing program policy statements” would provide many options for free formats for a policy statement. Just keep in mind, that each policy must be altered to cover the type of testing you employ, such as lab testing vs. onsite testing with instant Drug Test Devices which may be a greater cost saving for you, or references to which staff at your organization may oversee the program, etc. One such resource for information might be The U.S. Department of Labor’s Working Partners for an Alcohol and Drug-Free Workplace Program Advisory archived website which offers a download of a sample policy that can be modified. Please note, however, that it is an archived site and the Free E-Law assistance at the Department of Labor is no longer available. The Society for Human Resource Management/SHRM is another of many resource providers that makes policy papers and other resource information available to employers needing assistance. Once you have determined how you want to begin to test your employee base, assessed all of the legal requirements in your State and industry that impact your testing, prepared a clear testing policy statement, and thought about the prevalence of what drugs may be available and abused in your area, the next step will be to choose the type of drug test or tests you may want to use for your program. 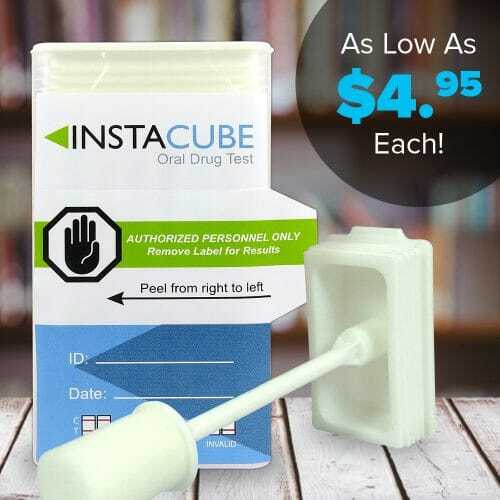 Generally, the most cost-effective test an employer can use is an onsite instant Drug Test device but, depending on the type of employees you must have on staff or how you choose to test for pre-employment purposes, you may need to supplement the onsite testing with limited lab testing. You may also need to consider some special tests if any of your employees are health care service providers or even have health related issues that impact the type of specimen they are able to provide. DrugTestsInBulk.com is eager to assist you. 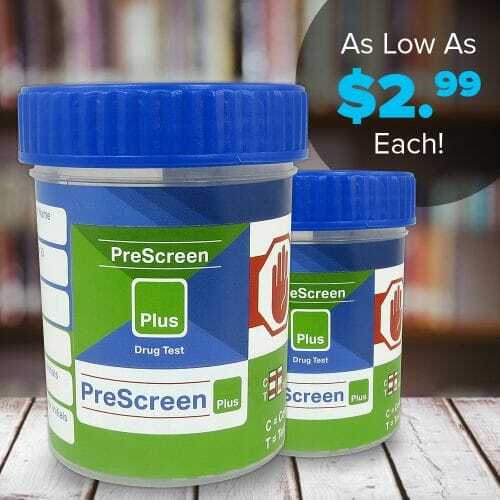 Whether you want to consider an onsite Drug Test Cup, a Dip Drug Test, or alternate options, DrugTestsInBulk.com has a broad assortment of options at highly competitive prices to assist you in setting up your most effective and cost saving program. Our friendly staff is prepared to answer all of your questions for your specific program, and you may contact us directly at (866) 465-2855 or use our online contact form at DrugTestsInBulk.com/contacts to request assistance. You can also view all of our options and order online at a time convenient for your demanding schedule at DrugTestsInBulk.com .